A stunningly simple hand-tied bouquet which is available in white or pink. 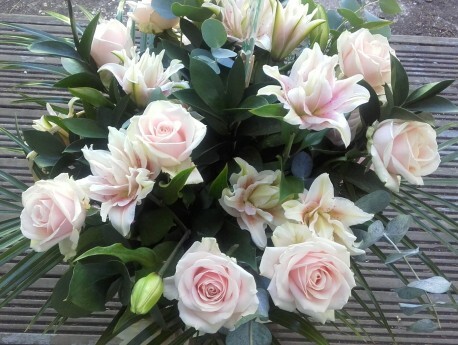 The picture shows our top of the range bouquet which features the premier blush pink "sweet Avalanche" Rose and double flowered pink oriental lilies with eucalyptus, green palm foliage and Ruscus. We can create a similar bouquet with white scented Oriental Lilies and white Avalanche Roses or why not choose Purple Lisianthus, Statice and Veronica to accompany white Oriental Lilies? If you can't decide then leave it to us to choose the very best of the day! Not sure if your recipient likes Lilies? The large Oriental lilies can be overpoweringly scented and if you are not sure about including them we can offer Asiatic Lilies which are slightly smaller but equally attractive and unscented. The bouquet shown is Hand-Tied and Aqua -packed for convenience. Every bouquet is wrapped in co-ordinating cellophane and tied with matching ribbon. We'll choose a matching gift card to write your message on too. The Deluxe and Luxury versions are suuplied in a gift bag or transporter box.